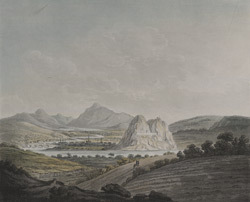 View of Dumbarton Castle on an isolated rock at the confluence of the Rivers Clyde and Leven in Scotland. The strategic importance of the 254 foot high rock has been recognised for hundreds of years and a fortress has stood on this site since the 5th century; the first reference to it is in a letter from to St Patrick to King Ceretic in AD 450. The rock became known as ‘Dun Breatann’- the fortress of the Britons, as it was the capital of the Ancient Briton’s Kingdom of Strathclyde.